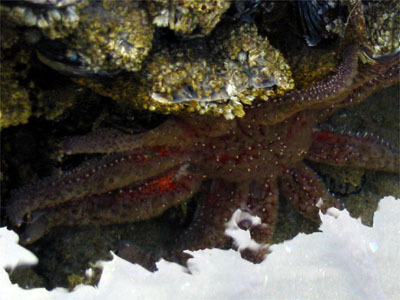 The sunflower sea star is easily recognized by its many arms. They are effective predators, but less durable than the more abundant ochre sea stars. Their body stucture is unable to withstand the rigors of exposure during low tide. So, if you are to see them, you'll need to search the lower intertidal pools.